“MONSTROUS MOVIE MUSIC” contains a 27-minute suite from one of the greatest giant monster movies, Warner Brothers THEM! 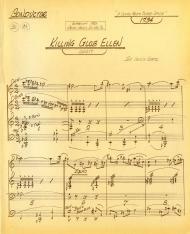 Bronislau Kaper's landmark 1954 score ranks among the composer's greatest works, full of suspense, mystery, and thrills. As if the sixteen cues that recapture the film’s drama aren't enough, also included as a bonus is Kaper's “Ant Fugue,” a brilliant composition that was completely dropped from the released version of Them! The perfect musical accompaniment for your next picnic, this fabulous giant ant score will have you crawling with excitement! Also on “MONSTROUS MOVIE MUSIC” is a 20-minute suite from IT CAME FROM OUTER SPACE, Universal-International's classic and intelligent science fiction 1953 production. The memorable score was a collaborative effort by Henry Mancini, Herman Stein, and Irving Gertz, and the fourteen cues beautifully recapture the atmosphere of the film. This music was such classic sci-fi writing that the studio re-used it in Revenge Of The Creature, Monster On The Campus, and countless other pictures. Adding to the ‘50s excitement is the inclusion of that unique electronic instrument, the Theremin, whose “ooo -wooo-ooo” characterizes the mysterious aliens who have landed on Earth. And unlike other record labels who try to simulate Theremin sounds by fiddling with their synthesizers or having women make high-pitched sounds, the hard-working folks at Monstrous Movie Music proudly present a real Theremin! And as yet another bonus, you'll also hear the cues without the Theremin added to the mix, since this was how the music was originally recorded on Universal's scoring stage over 45 years ago! IT CAME FROM OUTER SPACE’s out-of-this-world score continues to influence after all these years! Also included on the CD are three cues from Universal-International's silly-but-beloved THE MOLE PEOPLE, a 1956 movie about burrowing critters from a long-lost civilization. The next time you’re in the mood to watch a picture about underground Sumerian albinos, this film should be right at the top of your list! The music by Herman Stein and Heinz Roemheld perfectly sets the tone for The Mole People, with the “Main Title” being one of the most electrifying of its type. Finally, “MONSTROUS MOVIE MUSIC” includes a 9-minute suite from Columbia’s 1955 giant octopus flick, IT CAME FROM BENEATH THE SEA, featuring Ray Harryhausen’s astonishing special effects. The music by Mischa Bakaleinkoff includes cues written specifically for the picture, as well as ones originally composed for Wyoming Renegades and Women's Prison that were re-used in Ray's stop-motion spectacular. 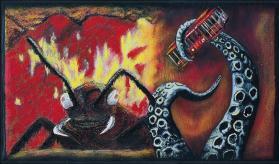 The explosive music for IT CAME FROM BENEATH THE SEA was subsequently re-used in Harryhausen's Earth vs. The Flying Saucers and 20 Million Miles To Earth, as well as in other Columbia films like The Giant Claw and the Three Stooges’ Have Rocket, Will Travel. It’s music sure to bring out the Moe, Larry, and Joe DeRita in you! The 32-page liner book features exciting cover art by Robert Aragon, 14,000 words of information about the films, their scores, and the composers who wrote them, as well as a ton of silly humor. 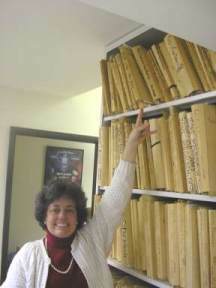 The book also contains 19 photos (some in color), including never-before seen-copies of the music manuscripts. The liner book text includes timings that match the digital read-out on your CD player -- so you can follow along with the music while you read. You’ll become a monstrous movie music expert in less time than it takes a colossal insect to crush a car! through PayPal by clicking below! 38 - 42. "Bonus Tracks"
Order direct from Monstrous Movie Music! Contents of this website Copyright © 1996 - © 2019 Monstrous Movie Music. All rights reserved. Monstrous Movie Music is a trademarked name.